You’ve now chosen a moving company to assist with the big move to your new home using everything you learned in our Moving Series Part I: Hiring a Mover. With moving day approaching, there are still a few things to consider. Will you need storage for the move? What sort of packing system is best? On the day of the move, will there be any special considerations for parking? It all can be overwhelming, but breaking it down to simple steps can help alleviate unnecessary stress. When there’s either a lot of packing to be done or storage needed, PODS are a great option. PODS containers have a lot of flexibility when it comes to what they can be used for. When renting from PODS, a unit is delivered directly to your current residence, where you’ll be able to pack as much or as little inside at your own pace. When you’re ready, a PODS driver will come to pick up the unit and deliver it to wherever you need, whether it’s across town or the country. If you’re not ready for it to go to your new home, the unit can be stored at a secure storage facility until you need it again! PODS come in three different sizes to accommodate varying client needs; 7 foot container (typically holds 1 room), 12 foot container (typically holds 2-3 rooms), and 16 foot container (typically holds 3-4 rooms). Each allows natural light to enter the unit and can be opened easily with a roll up steel door. Weather resistant, you won’t need to worry about your belongings getting damaged. The cost for renting one or multiple PODS will depend on your specific needs. The site for PODS has a form you can fill out to get an estimate. In order to organize boxes, you’ll need to find a place to get them first. Many grocery stores and liquor stores are willing to give away boxes for free; all you have to do is ask. Free or moderately priced boxes can also be found on Craigslist, Lowe’s, or Home Depot, which can usually be more cost effective than buying packing packages through stores like UHaul. Even the thought of packing all your belongings can make anyone nervous, but there are ways to make the process much more manageable. Keep a list or record of what you pack. As you’re loading a box, write down every item that goes inside. This way when you’re looking for something as you’re unpacking or want to know what exactly is in a particular box, you’ll have an easily accessible list without having to unpack the wrong box or rummage around. Have plenty of supplies on hand. Even if it means buying more than you think you’ll need, you’ll be thankful to have an abundance should you come into a tight situation. If you buy your boxes through the moving company you’re using, you will likely be able to return any unused items for a refund. Having a certain number of boxes set aside for emergencies on moving day can also be helpful. Wardrobe boxes can be a big help - whether for hanging clothes or for other bulky items such as comforters, pillows, gift wrap tubes, or large baskets. Color coordination can be your best friend on moving day. Assign a different color to each room so boxes can easily brought from the truck to their respective residence in your new home. Whether you use small colored stickers, markers, or even colored packing tape, this can make the moving-in process a breeze. Keep things together as possible; lamps with lightbulbs, picture hooks with their frames, extensions cords with appliances. This will eliminate the loss of any pieces, allowing you to set things up more quickly and efficiently as you’re trying to settle. If your moving company is persistent about removing items such as these to lessen chances of breakage, have a “Parts” box as a backup. As things are put into the box, keep small items such as nails or clips in plastic baggies, labeling each before they’re left in the box. Have everything packed ahead of time. Procrastinating packing will only lead to headache and turmoil on moving day. Leave yourself plenty of time; you’ll be able to go at a steady pace without feeling rushed or losing anything in the midst of panic. Use your luggage! You remember that beautiful luggage set that sits in the back of your closet collecting dust the majority of the year? Now is its time to shine. What a better way to pack clothes than in a rolling container that was built to hold them? Consolidate your cleaning supplies. You may want to clean the new house before you fully unpack and if it’s a yucky day, the movers might be tracking in dirt or mud. So keep your cleaning supplies in one place where they’re easily accessible so that you can start your life in your new home clean and fresh. Create a “Right Away” box. 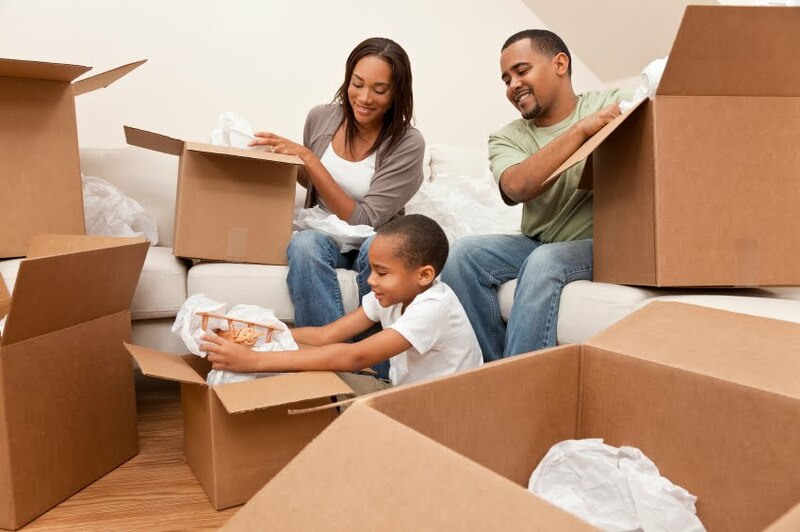 You will not be able to have your home completely unpacked and settled on moving day, but your family will have certain things they need right from the start. Have each family member pack a “Right Away” box containing items such as a towel, clean sheets, a couple extension cords, etc. Consider keeping important items with you. Antiques, jewelry, valuables, and/or important documents such as birth certificates aren’t things you’ll likely want to throw into any old box. Keep these things carefully packaged and together, labeling with a non-descript label such as “Misc. Kitchen Stuff” so not to draw attention but to have it easily recognized by you or a member of your family. Prior to moving day, you’ll want to establish how all your vehicles, including the moving trucks, will be able to park. If you have a driveway at your new home, this may not be an issue. In most urban areas, you may need a moving parking permit so check with your town or city hall to find out how to obtain a permit and posting guidelines. Click these links to find out more information for parking permits in Boston, Newton, and Brookline. You can also ask your moving company to handle the permits; many will deal with everything for a fee. Moving is known to be a stressful experience, but following some of this advice can help make it a much more tolerable process for everyone involved. Lastly check out Part III in our series: It's Moving Day! City of Boston. Street Occupancy Permits. Retrieved from http://goo.gl/p8eBfH. Nafie, Coral. 12 Terrific Moving Tips for When You’re Moving Your Home. Retrieved from http://goo.gl/eNC7a. PODS. Local Moving with Storage - What Size Fits Me?. Retrieved from http://goo.gl/iSoZLp. Miller Supply, Inc. Color Coded Moving Tape [image]. Retrieved from http://goo.gl/WKEKDM. Dwell360 is a residential real estate firm based in Newton, Massachusetts, servicing the cities and suburbs of metro Boston. Our experienced real estate agents will not only manage the sale or purchase of your home, but they will also provide you valuable resources and advice as you make your move. Search for homes in Massachusetts and then give us a call.